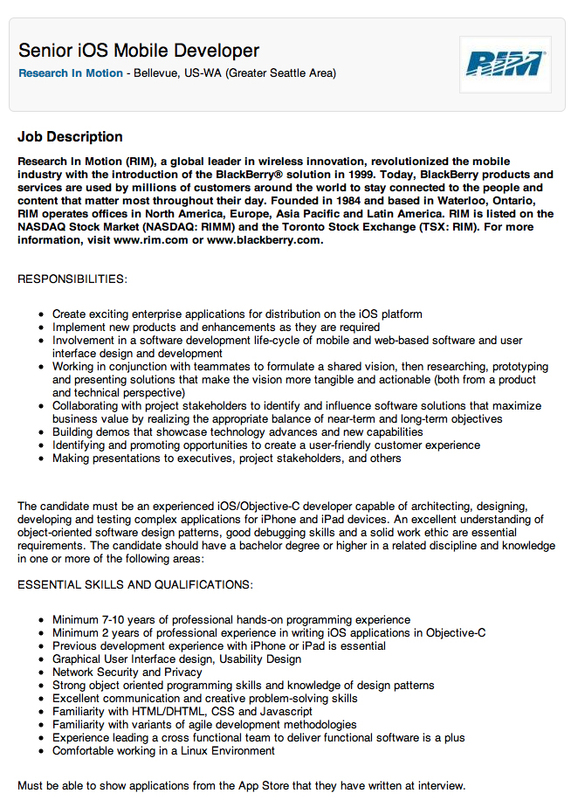 Okay this may sound a bit weird but Research In Motion (RIM) is out in the open to hire iOS developers (with loads of experience) to develop apps for the Canadian giant. We don’t have details as to what RIM wants the developers to create but it is more likely to get a BlackBerry Fusion app developed for iPhone and iPad as RIM has previously said that the app will be made available to its enterprise users over their iOS and Android devices. RIM is looking for “an experienced iOS/Objective-C developer capable of architecting, designing, developing and testing complex applications for iPhone and iPad devices.” RIM wants the iOS developer to have at least 2yrs experience and also have apps in the iTunes App Store to demo during a candidate interview. So it is really the BlackBerry Fusion app or may be RIM is also secretly planning to bring its popular BlackBerry Messenger (BBM) app to the iPhone and iPad? Well that can also be the case. Any takers?